Marble floor designed by Luxury Antonovich Design will create a unique exquisite style of your home. Design opportunities of a natural stone are really limitless. The floor can be made of tiled marble or become a palace interior decoration with mounting into the base of various artistic drawings of various forms in a multicolor combination of fragments. Our company offers the development of a unique design of marble floor and a full range of works with the provision of marble selection from our own collection or worldwide manufacturers. Marble is a unique high-strength material which, having excellent operational characteristics, is ideally suited for floors fit-out. The unique natural pattern of the stone, as well as a large selection of textures and shades open up unlimited possibilities for combining, so marble tiles for the floor are often used in a variety of design projects by Luxury Antonovich Design. The device of marble floors can be different: homogeneous, made of one type of stone, and also have different textures, where several colors and types of surface can be combined. Marble tiled floor with spectacular graphics. 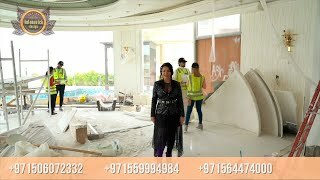 The marble floor will be a great basis for creating a unique interior design and decoration with elements of natural stone cladding. Marble floors from Luxury Antonovich Design are durable and practical. Able to resist increased loads for a long time, resistant to abrasion.